Of late it has become very common for research compilers to emit C as their target code, relying on a C compiler to generate machine code. In effect, C is being used as a portable compiler target language. It offers a simple and effective way of avoiding the need to re-implement effective register allocation, instruction selection, and instruction scheduling, and so on, all for a variety of target architectures. The trouble is that C was designed as a programming language not as a compiler target language, and is not very suitable for the latter purpose. The obvious thing to do is to define a language that is designed as a portable target language. 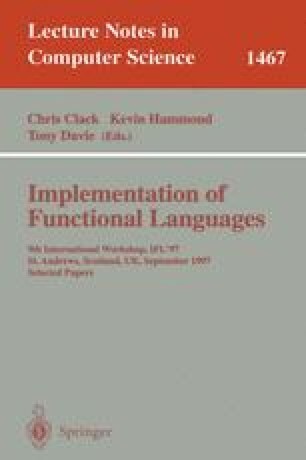 This paper describes C--, a portable compiler target language, or assembler. C-- has to strike a balance between being high-level enough to allow the back end a fair crack of the whip, while being low level enough to give the front end the control it needs. It is not clear that a path exists between these two rocks; the ghost of UNCOL lurks ominously in the shadows . Yet the increasing popularity of C as a compiler target language (despite its unsuitability) suggests strong demand, and provides an existence proof that something useful can be done.